Anne-Lise Børresen-Dale, professor at the University of Oslo and head of the Department of Genetics at OUS Radiumhospitalet, has been honored with the eighth annual American Association for Cancer Research (AACR) Distinguished Lectureship in Breast Cancer Research at the 2015 San Antonio Breast Cancer Symposium, being held Dec. 8-12. Here, she presented her lecture, entitled “Molecular Evolution Under Neoadjuvant Chemotherapy”. Børresen-Dale is among the leading geneticists in research on molecular biology of breast cancer, and her group was among the pioneers in expression profiling of breast carcinomas in collaboration with groups at Stanford University in Stanford, California, demonstrating that breast cancer can be divided into distinct sub-groups with differences in molecular profiles and in overall and relapse-free survival. Her achievements are seminal for understanding breast cancer evolution, and have had an enormous impact on our view of the complexity of breast cancer. She has authored more than 450 published scientific papers, book chapters, and invited reviews. Børresen-Dale’s current research projects focus on exploring the systems biology of breast cancer using high-dimensional data in integrated approaches. These studies aim to identify the genotypes and gene expression profiles that contribute to elevated cancer risk, radiation sensitivity, tumor aggressiveness, and therapy resistance. The goal of this work is to follow the linear time course of tumor progression to dissect the molecular mechanisms triggered at each stage of disease. Using a systems biology approach, the Børresen-Dale lab follows the multidimensional interactions at various levels to improve risk estimation, prognostication, and prediction. 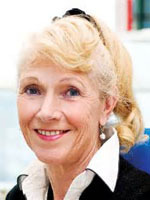 Throughout her career, Børresen-Dale has been recognized with numerous other awards, including the Swiss Bridge Award for Outstanding Cancer Research in 2004, the Möbius prize for Outstanding Research from the Research Council of Norway in 2008, Germany’s Helmholtz International Fellow Award in 2014, and the Fridtjof Nansen Award for Outstanding Research in 2015. Børresen-Dale has been a member of the AACR and the European CanCer Organisation boards of directors, is past president of the European Association for Cancer Research, and is an elected member of The Royal Academy of Science, Norway, The Norwegian Academy of Science and Letters, and the European Academy of Cancer Sciences.